The punishment of those who wage war against Allah and his messenger and strive with might and main for mischief through the land is: execution, or crucifixion, or the cutting off of hands and feet from opposite sides, or exile from that land: that is their disgrace in this world, and a heavy punishment is theirs in the hereafter. "A unified Islamic state is the end game.... The media can mock all they want, but it will not make it go away." "In the emerging battle lines of post-revolutionary Egyptian politics, many liberal activists and observers abroad say they fear that the Brotherhood’s organizational strength will give it an edge in the elections for Parliament this fall..."
"When it comes to Egypt, the best organized will win. And when it comes to any organization, the best organized will win. That's why I've been telling you, please gather with friends. Please organize. Please reach out to others." The radicals, Islamists, communists, and socialists are the best prepared while the rest of us are told not to pay attention. "What I'll show you tonight is a group of people who have a constitution ready to replace ours... and they are active from city to city, country to country, all across the globe." Eric Stackleback will be reporting on this. Beck reminds us that he warned NY in 1999 about bin Laden, warned us to take him at his word. He warns the same of the group we'll be learning about tonight. "Listen to what they say is coming." 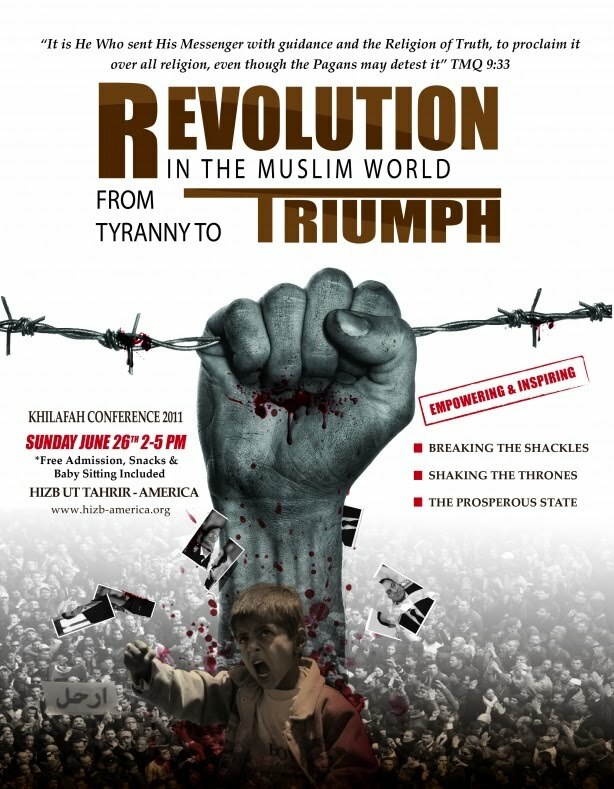 Video and poster of the latest Khilafah conference: "Victory is near, and the time is now"
These are happening all over the world. They have these in at least 43 countries, although there may be more. Since they are banned throughout the Middle East (+ Russia, +post-Soviet states, + Germany...) and must operate clandestinely, the final-final count is unknown. Hizb ut-Tahrir's website offers an FAQ, including "11. What are the opinions of Organizations and individuals regarding Hizb ut-Tahrir’s ideas and actions". Among the answers: ""…it advocates the restoration of the Islamic caliphate. It differs from jihadi groups which share this objective in abstaining from violent activity." [International Crisis Group, 2/3/05]"
Beck holds up the International Crisis Group's report on Understanding Islamism. "The International Crisis Group is the one we told you about last year, the helped to create The Responsibility to Protect Initiative," created by Samantha Powers, wife of Cass Sunstein. "Who's at the head of this, who's creating a lot of the funding for this [Beck holds up "Understanding Islamism"]? George Soros." "This is the group that pushed us into the war with Libya." They aren't protecting you, they're protecting Hizb ut-Tahrir." Hzb ut-Tahrir is talking about violent, revolutionary overthrow of the U.S., and the media is silent. Beck has video from the Chicago conference where they "make the case for the end of capitalism and the spread of Sharia Law and the spread of globalism and the return of the Khilafah." The footage can be difficult to hear due to the echo in the hall. Raw video available here via GlennBeck.com. Beck plays clips from Breaking the Shackles. It's intense stuff.... "Break the shackles of capitalism, nationalism, secularism, and tribalism..." "Uproot all these systems..."
Beck: "Uproot all of these systems and plant a caliphate.... Take note that it is capitalism that is keeping them in shackles. You." Plays clip to show how the other shackle is nationalism and why they hate nationalism. "We Muslims in the United States are an inseparable part of the International Ummah and we should never accept [nationalism, tribalism, anything...] that separates us from one another." Beck: "I want you to remember that part. They don't want their body to be separated. We are one ummah. One ummah. One group of people living under Islam. No matter where they live." "These people [radicals, Islamists, socialists, communists] are not really working together in the traditional sense. They are working against a common enemy. And that common enemy is the Western Way of Life. Israel. Capitalism. And the United States of America. So they will work together until it doesn't match up anymore. But by that time, capitalism and the Western way of life is gone. It's time for us to wake up." once he came to power, they were thrown out in the waste basket. Literally, Glenn. A few months after he came to power, he rounded up the communists, the socialists, the Left. Imprisoned them. Executed them. So I think that is a cautionary tale for today's left. Very short sighted to work with these guys. They don't know who they're getting in bed with with jihadists." Beck talks about how "you" (they) are fighting a union thing, an anti-American thing while they are fighting for God. If you partner with them (Islamists), you lose. Stakelbeck builds on Beck's note that in every country the Islamists are the most organized and doubles down by calling them "the most ruthless.... You look at Egypt -- and God bless these young Facebookers that are involved with Tahrir Square -- but at the end of the day they will be swept aside by the ruthlessness of the Islamists." Beck asks Stakelbeck to explain how this group is in America and all over the world. ES: "It's all connected." Stakelbeck says Hizb ut-Tahrir has connections to radicals in Great Britain, specifically noting Anjem Choudary. (Stakelbeck interviewed Choudary over a year ago, prior to the Arab Spring. Stakelbeck says Choudary is one of the most notorious Islamists in Great Britain. Beck asks if he feels evil in him. ES: "You and I talked about that before, Glenn. When you're in a room like that with a guy, face to face, you feel the presence of evil. Yes, you do. I felt it a few times in my life. That was one of the times." Anjem Choudary "is one of the guys who sets the blueprint for Hizb ut-Tahrir." To further point to connectivity, Stakelbeck notes there is a group nearby (to them, in NY -- in Queens), the Islamic Thinkers Society (Beck: "Bad dudes..." Stakelbeck: "Very bad dudes"). They are linked. Choudary is the ideological leader of all of these conferences. "This is serious business and the people who are standing against it are alone," but Beck will have some resources and ideas for what we can do. Revolution. Clips from the conference in Chicago this summer: "It is important for us to read the history... History repeats itself.... Shaking of the thrones... It's like a dreadful, fearful occurrence to them, that the Muslims simply want to unite and live under Islam." Beck points out a clock on his set that says "history repeats itself" on the face. "He said, he could've sounded like he was giving a speech written by me: Read History, this is historic times. It's time to be a part of history, not just watch it. It's all too familiar. This is almost the same thing that I say to you tonight, but there is one difference. Their path leads to revolution. It leads to hate and destruction. My path does not. For their success to happen, it requires something else to happen, and that is the collapse of capitalism, period. It doesn't work any other way. They know this, and they ultimately strive to be what he calls 'The Final Superpower of the World'". Hizb ut-Tahrir conference Clip: "Do we want khilafah?" "Yes!" "Let this revolution continue until it is complete. Let this revolution give birth to the final superpower of the world. Do not let the sacred blood of our martyrs go in vain. Khilafah, unity, and liberation are within reach." Beck: "Notice the words they are using and how many of these words are being used by the Left now. Unity and liberation: this is the battle, America. Whether anyone in the MSM cares to admit it, whether anyone in the halls of power in the United States care to admit it, if it is politically incorrect, so be it. It is good versus evil, period. Freedom versus oppression, period. Killers versus liberators. We're in a battle, and yet we are not fighting. We're too worried about typecasting too many Muslims as terrorists on TV. We're searching our grandparents at the airport because we don't want Muslims to feel singled out. Well, you know what, America is a fair nation. We do have fair play in our heart. We don't want anyone to feel singled out. But what we've lost here is common sense. For years, I asked, 'Where are all the good Muslims? Where are they??' Well, they are here. We featured them on 9/11, on our 9/11 broadcast. They are begging for America to wake up, but the MSM ignores them. They are begging. Many of them and their parents moved here to get away from the oppressive regimes in the Middle East. They know far better than any American scholar or any talk show host about what these people mean and what these people mean to do. What is life like under Sharia Law? Watch." Hizb ut-Tahrir clip: "How would our lives be under the khilafah? Islam will be made supreme in the land. islam will be the ruling system in the land. [fuzzy] The military will be in the hands of the Muslims. [fuzzy, something about "we would have a state that carries out that ideology." Beck: "They have a state that carries out that ideology. It's called Iran. The fact that they wouldn't be called terrorists anymore because they would have a state supporting their ideology -- not exactly reassuring. They are, by definition, terrorist states. Islamic rule does not peacefully coexist with other religions or institutions. It replaces or kills them. Eventually, it replaces or kills all of them, because they believe, quote, 'the Qur'an is a message for all mankind and a solution to all man's problems.' It's not a problem that one Muslim might believe that or all Muslims might believe that. The problem comes in enforcing that." Beck: "At the end of their conference they handed out the key points of their constitution. You wanna know what it would be like? Are they really, truly peaceful? Is this something that we can coexist with? Article 7 describes that the state will be charged with implementing "divine law', therefore -- quoting -- 'all those guilty of apostasy (murtad) from Islam are to be executed, end quote. Article 56: Military training is mandatory for readiness for jihad. "But I thought all of the world's problems would go away. Why would there be a need for jihad? Here's why. Because they will kill you if you disagree with them." Beck references a Blaze article about Saudi women lashed for violating a driving ban. "Rampant sexism is guaranteed. Under their constitution, strict gender segregation. Women are not allowed to hold positions in government." Article 157: Israel is restricted from foreign trade. "At the 2009 conference, the leaders confirmed that the constitution of the United States would be replaced. Their constitution would replace the American constitution. In their own words--"
clip: "Would you get rid of the constitution for Shariah, yes or no?" "Over the Muslim world? Yes, it would be gone." "And so if the United States was a Muslim world, the constitution would be gone?" "If the United States was in the Muslim world, the Muslims who are here would be calling and happy to see the Shariah applied, yes we would." "And the constitution gone. That's all." "Yes, as Muslims they would be long gone." At the July conference in Australia, there was more finger pointing at America. clip from Australia conference: "...such that Islam takes the place of leadership of humanity. Guides humanity out of darkness and into the light, into the light of Islam. But today we have America, the West. Entire superpower states standing in the way.... They have mobilized all of their resources, and they have unleashed all of their forces to curb the rise of Islam. And therefore, the Muslims today also need a state, an Islamic state, the khilafah, so that we can mobilize all of our resources, all of our forces. The establishment of the khilafah is not a pipe dream. It is a reality. It is possible. It is not only possible; it is imminent. It is a reality that is about to come true soon in [inaudible -- somewhere island?]." Beck: "The one remaining question left unanswered is this: Does it have popular support among Muslims? Yeah. This is an impressive group with a strong global presence. I don't know, we'll have to go back to Erick and one of our guests in a few minutes to ask them 'How about here in America?' But, in the Middle East? There are about a few billion Muslims. Are there enough to move this forward? It's a good question. And we should take a look at the actual facts here." Beck struggles moving his new mega chalkboard (which this editor thinks is a bit adorable). "If you look at these facts... [on chalkboard]"
"This is extremely important. The hatred. The hatred. Not the let's coexist and all move along. This is not the Gandhi movement. We saw it when Christiane Amanpour was interviewing the Egyptian protesters. And the guy said back to her, 'I hate you. I hate America." (shows clip.) Remember, this happened to Anderson Cooper, too. It happened to Fox. They were in danger. This isn't some loon off the street. They hate us. Don't be mistaken. They don't hate us for our wealth. They don't hate us for our lifestyle. These are religious extremists far beyond what we have ever known in our lifetime." "To survive, we cannot think like Westerners. We have to think like those in the Middle East. We cannot listen to people telling us to ignore it. These are the same ones that are excusing the extremism. 'Oh but they don't mean that. Oh, but they're just like us. Why do you hate them?' I don't. I don't. I can coexist with anyone that doesn't wish to kill me. Yet, the people who tell us that they're exactly like us, also at the same time complain that we are trying to impose our values on them. If they're the same as us, then we wouldn't have to impose our values. We would all look at people the same way. The Left tries, as it always does, to have it both ways. Enough is enough." "We have the Westboro Baptist Church in America. I agree, the Westboro Baptist Church is a church of hate. Clearly, a church of hate. But this church has 73 members, total. And many of them, I think, are all one family. Now, there is a strong mobilization in America against their vile hatred, and rightfully so. have you noticed how many times you've seen the Westboro Baptist Church on television? May I ask how many times and how much push back you've seen on the khilafah conference? How many times have you seen them on television? How many times have you heard these people's words on television. A conference that happens in over forty countries across the globe? Hatred is brewing. And the radicals, the Islamists, the communists, the socialists are in on it together. On Wall Street, in Westboro, and in our own [something], there are people who wish to kill us." "I know I bring you a lot of news that you don't want to hear. I know that. I said to my staff earlier today, 'If you think it's bad listening to me, you should think like me.' There's many things that I think that I have not said. I unfortunately have this strange ability -- no, I was going to say to think like them, but I don't. I just believe them. When people say, 'I'm gonna kill you,' I believe them.' Too many dismiss." The amount of people who come to GBTV proves to Beck that there are people of courage. "You watch this show tonight to face the problem, prepare, and then pray that I am wrong." "I didn't have the track record in 1999 when I said that about Usama bin Ladin. Nobody would listen to me then. Thank God, thank God you are here. The press all but ignored Lara Logan from CBS. I'm gonna play her words at the end, because she was there at Tahrir Square when the world was praising this glorious revolution and calling it a peaceful demonstration. She was there. She knows the truth, and she knows the hatred." Logan clip: "They were trying to tear off chunks of my scalp. My head, my head in different directions. ["Pulling at your hair?"] Oh yeah. And not, not trying to pull out my hair. Holding big wads of it and literally trying to rip my scalp off my skull. And I thought, when I thought, 'I'm gonna die here.' And my next thought was, 'I can't believe I just let them kill me.'" Beck: "They were trying to kill her while they were chanting, 'Jew Jew Jew.' They believe we are trying to humiliate the Muslim world and fight against Islam. No. We are not. Unless your definition of Islam is defined by extremists. There are Muslims here in America who are trying to fight this evil, and they are begging us to stop being politically correct." Beck talks about the man in St. Louis (with the Star of David carved into his back), says that the man sent the picture to Beck. "We have a responsibility to stand with the Jew. And to stand with this man, a Muslim. We stand with anyone who rejects hatred and violence. We have a responsibility to protect them, as individuals, and to let them know that they are not alone. This man used to live in St. Louis. He used to be an attorney in Iraq. He moved here for a better life. He's afraid for his life. He said that he's got to get out of St. Louis. he said they're gonna kill him. But he doesn't know where to go. He barely speaks English now, and he doesn't have a job." "We have the strategic oil reserves here in America. They hold 727 million barrels. The strategic oil reserves!... We'll just use that if there's a problem. They are designed to fuel our military in case there is a strategic stoppage of oil and flow from the Middle East. You know how long it would fuel just our military? 34 days. Only a suicidal people don't have a back up plan for serious disruption when that area of the world that area that holds 72% of the reserves is in revolution. That area of the world has 61% of the world's gas reserves. 22.6% of the world's uranium reserves. And has substantial iron ore reserves. More resources that we will lack, because we will not prepare. Here's one more disturbing resource they hold: it has the second largest dollar reserve of around 1.65 trillion dollars. It is the fourth largest economy in the world with 7.4 trillion dollars per year in GDP." "Let me ask you this. If the Middle East decided to work together and to dump the dollar, do you think that it would not be done in one afternoon? "The united caliphate, the Islamic khilafah, will control the major geopolitical strategic locations of the world's sea and land and in air routes. It will enjoy the monopoly of these strategic assets and bring countries like China, Germany, Russia, and Japan under its direct influence. That's a quote from the conference. But did ya notice that America was not in that equation anywhere? Hmm. Where do you think we are? "If you replace the word Islam with the word socialism -- Indeed socialism is the only cure to the disease that we witness due to the implementation of criminal and bankrupt ideology of capitalism -- that's a phrase that could've been spoken by one of the revolutionaries on Wall Street this afternoon here in New York. "By the way, social justice is huge in the Islamic world. Wake up. What I told you in January -- radicals, socialists, communists, and Muslim extremists are working together -- is here. And it is time to stand together in peace, and shoulder to shoulder. Solutions and some history in hour 2. Note from the editor: all quotes are from Beck unless otherwise noted. Mistakes are mine. (If you notice any, please comment so that they can be corrected.